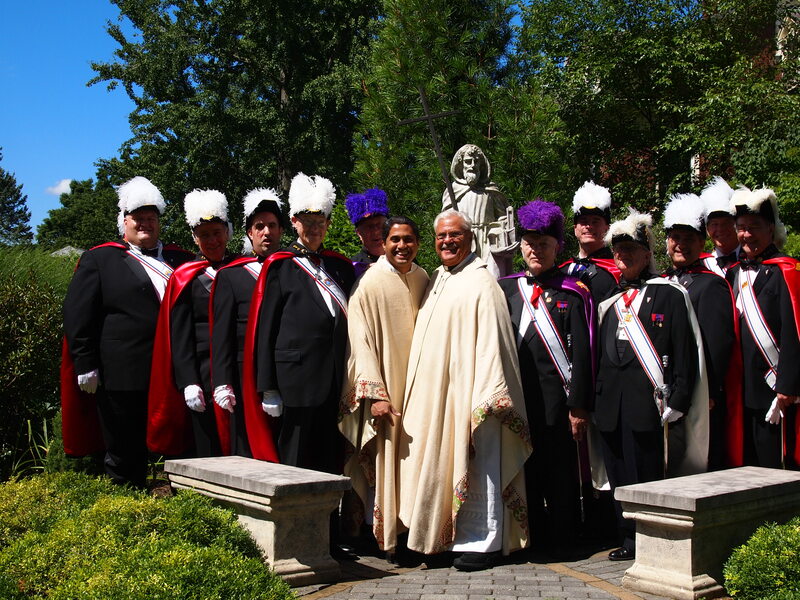 On Sunday, August 4th, 2013, the Brothers of Bishop Fenwick Assembly 100, Norwalk, CT, provided an Honor Guard at the 10:00 a.m. Mass at St. Philip Church in Norwalk celebrating the 60th Anniversary of the inception of the Diocese of Bridgeport. The Mass was organized by St. Philip Associate Pastor Father Sudhir DeSouza. As part of the city-wide celebration, parishioners from several Norwalk parishes(St. Mary, St. Matthew, St. Joseph,and St. Thomas) joined the parishioners of St. Philip in worship on a beautiful Sunday morning. The Honor guard was led by Faithful Navigator and Color Corps Commander Bill Berger, who was joined by Sir Knights Bob Kramer, Donald Hunter, George Ribellino, Michael Colaluca, Anthony Armentano, William Scholl, Scott Mazzo, Anthony Cossuto, Ed McGettigan, and Jim Wardwell. During his homily, Fr. Michael Boccaccio (Pastor of St. Philip) spoke about the inception of the Diocese, remembering each Bishop who has served our diocese from Cardinal Sheehan to our newly appointed Bishop–Elect Frank Caggiano. The Bishop-Elect will be installed on September 19th.